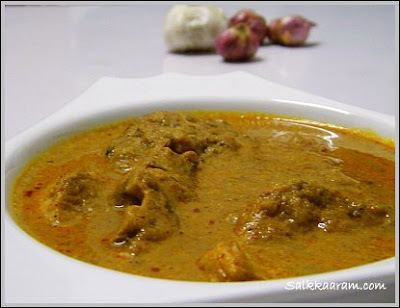 Goan Fish Curry | Simple and Delicious ! Goan cuisine is a mixture of different cuisines, and they have various dishes in sea food and meat. I tried this fish curry from vanitha, a recipe of Ammu mathew. The longer the process, the nicer the taste is true for this too, as usual. The fish fillets should have 1 1/2 inch length and breadth. Remove seeds from dry chillies. Grind it with tamarind and turmeric. Make a paste with garlic and ginger. Again grind small onions to a paste. Roast coconut in 1 tsp oil with fennel seeds until it gets little brown color. Allow this to cool, and blend with little water. Heat oil in a wok, saute small onions paste. When it turns color, saute garlic and ginger paste. After stirring for few seconds, add the chilly paste made with tamarind. Saute and put fish pieces into it, with vinegar and salt. Pour the blended coconut solution, and add enough water to cook the fish. Cook covered on a medium flame. When oil starts floating on top, pour coconut milk. Check for salt, allow to boil. When the curry turns thick, remove from fire. Add more vinegar if needed. 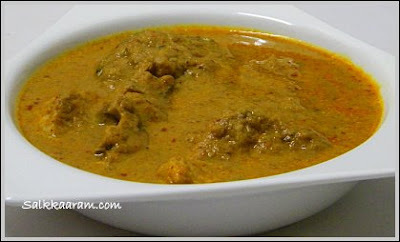 Wow really rich curry, with coconut and coconut milk, looks so yummy delicious. Wish i could have this for my dinner. I know what you say about all those mixers and grinders. My husband things am running a grinder business on the sly as I keep searching for different types of these things when ever I hit a mall. Yet to find that perfect one for idli dosa grinding here and am waiting for my trip to New Jersey where they say you get all the best ones. Looks yummy n delicious! Feels great to know the recipe..was looking for one for a very long time! I am using my third Sumeet, using Summet since 1989, love this grinder. I also bought Preethi, didn't like it much, it's sitting in the cabin now.Check this out. Seena, here is my Ice Cream maker, works very well, made loads of ice cream last Summer. It has a bowl inside the machine you need to freeze first to make Ice cream, make sure you have that space in your freezer before you buy. Bowl is about 6-7" in ht by 4-6" wide. Seens,nattilayirunnappol grinder vangal thannayirunnu enteyum pani..haha..vicharichathu ithu ente mathram vattannato..thanks for being the buddy..pinne Goan fish curry kalakki ketto. The curry is different and very delicious looking! oh..i love Goan food...am perfectly at home with Goan or Mangalorean food probably coz of the similarity with kerala cusine..and all the more coz fish is such a important part of the meal..this looks so delicious..
haha..mixer vaagi maduthu.ini nattil povumbho grinder kondu varanam..
goan fish curry adipoli. ivide curry vachaal kazhikathathu karanam fry amthrame ullu..
Ahhh the ever-popular fish curry I haven't had a chance to taste yet! Nalla rasamundu curry kaanaan.sure it will taste yummy too....About mixies, my mother-in-law has been using sumeet for very long time and she switched to preethi. She was happier with sumeet(eventhough it has a bomb-blasting sound).She said that sumeet lasts longer and blades are better in sumeet ones.Im too planning to buy one sumeet during my next visit to India. My mom went to buy sumeet in Abu-dhabi and she bought Meenumix after hearing the expert advise from one salesman and that is a horrible brand i feel. The small mixie for grinding chutney is good since it grinds real well, but the lid is loose and we have to keep our hand on top inorder to stop the lid from flying!!! Apart from that the blender is a waste. It wudnt even grind apples in them while making apple juice.U get chunks of apples in the juice even after blending it for very long!!! I love this curry Seena I will try it some time for sure. Yeah...lots of grinding and stuff...most of the south Indian dishes demand grinding so much!! Love this curry, spicy, rich and nice. The colour looks so good! I love goan fish curries.....they have amazing flavours! Wow!! What a GREAT looking goan fish curry! This dish looks so beautiful with the colours. It's a Very tempting and delicious recipe. Can't wait to see your posting, my mouth is watering. Will try it out soon. Thanks so much for sharing.